Our costs and fees are contingent upon the recovery of damages on our clients' behalf. That means if we do not obtain a verdict or settlement in your case, you pay our personal injury lawyers nothing. Also, consultations with prospective clients are always offered free of charge. If you or a loved one has sustained a serious personal injury in a car, truck, or motorcycle accident, on the job, or elsewhere, our attorneys can help you secure the financial compensation to which you are entitled. Contact our personal injury lawyers. Representing victims throughout the greater Bradenton and Sarasota, Florida areas, we serve each client with the best possible representation, the utmost skill and diligence, and an unsurpassed level of personalized attention. At Heintz & Becker, our staff of professional paralegals and legal assistants is essential to the success of our personal injury lawyers in court. 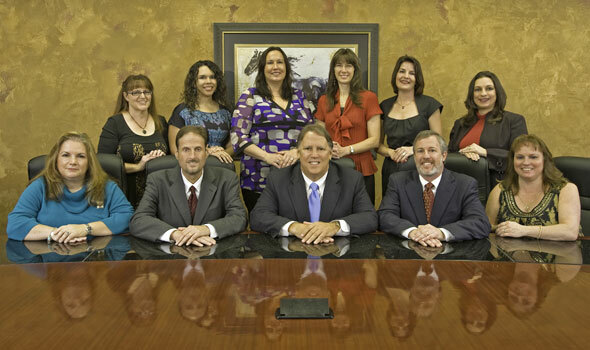 Whether they are communicating with clients in and around Bradenton and Sarasota or working behind the scenes to prepare cases for trial, our dedicated office staff is a big reason why our firm has been so successful. Stephanie Fleenor has worked for our firm full time since 1991. She also worked for the firm part-time while earning her degrees. Stephanie holds an AA degree from Manatee Community College and a BA in Criminal Justice from the University of South Florida and has held the position of Office Administrator since 1992. Katherine Noden began her career working for The Florida Bar in Tallahassee. After four years with the Bar and being steadily promoted until her last position as the manager of the Tampa branch office, she went to work for a prominent Tallahassee personal injury firm. Mrs. Noden has been working exclusively on personal injury cases for more than 30 years, and she has been with the firm of Heintz & Becker since 1992. Mrs. Noden is a paralegal member of the Florida Justice Association. Christina Fava is a graduate of Katherine Gibbs College. She became a paralegal in 1988 and is recognized as a Florida Registered Paralegal through the Florida Bar Association. In the past, Ms. Fava has specialized in federal law, personal injury and wrongful death. Since coming to work for Heintz & Becker in 2004, Ms. Fava has worked exclusively in the area of personal injury. She is a Certified Victim Advocate and in 2006 sat on the Florida State Board of Directors for Mothers Against Drunk Driving. Ms. Fava enjoys volunteering at the high school mock trials sponsored by Manatee County Bar Association. Veronica Barfield has been a certified legal assistant since 1995. After seven years as a legal secretary with an insurance company, she joined our firm in 2004. Her experience with insurance industry policies and practices is helpful in achieving a fair resolution to your claim. In order to stay current with legal issues, she regularly attends seminars. Julie Williams began her legal career in 1987. She has experience in motor vehicle, wrongful death, slip-and-fall and dog bite cases. Since coming to the firm in 2010, she has become a Florida Registered Paralegal and she continues to enjoy working in the personal injury field. Stephanie Begley joined Heintz & Becker in 2010. She is the Assistant Administrator for the firm. Stephanie, a Bradenton native, was recently married, is the mother of two children, two stepchildren and now has three grandchildren. She and her husband, Tony, enjoy traveling. She hopes to visit and photograph all of Florida’s lighthouses. Debra Townsend joined our team in 2013. She earned an AA from Manatee Community College, now known as State College of Florida, and has a Bachelor’s Degree in Management from Florida State University. She is the married to Scott and they have two children. Adrianna Cardin relocated from New Jersey in March of 2016 and joined Heintz & Becker in April. She has experience in the personal injury field for nearly 16 years and is continually taking classes to stay up on current trends in our industry. She is the mother of 3 children and is bilingual. Christy Kirker also joined our staff in April 2016. As the Vice President of First Impressions, Christy greets everyone at the door or on the phone with a smile on her face. This mother of three is married to Colin and also has her hands full with her beloved dogs.